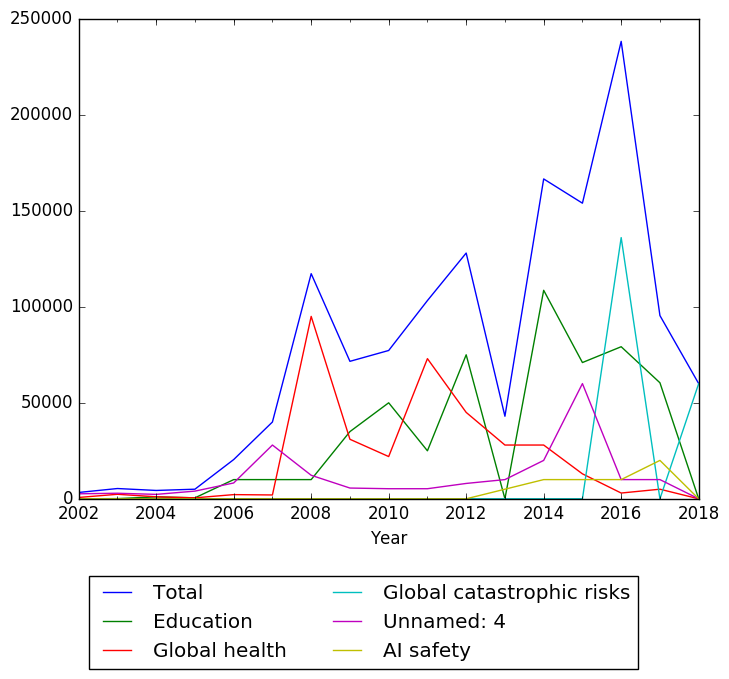 Global Catastrophic Risk Institute 16,043.00 24 2016 Global catastrophic risks https://www.gricf.org/2016-report.html -- c/o Social & Environmental Entrepreneurs. 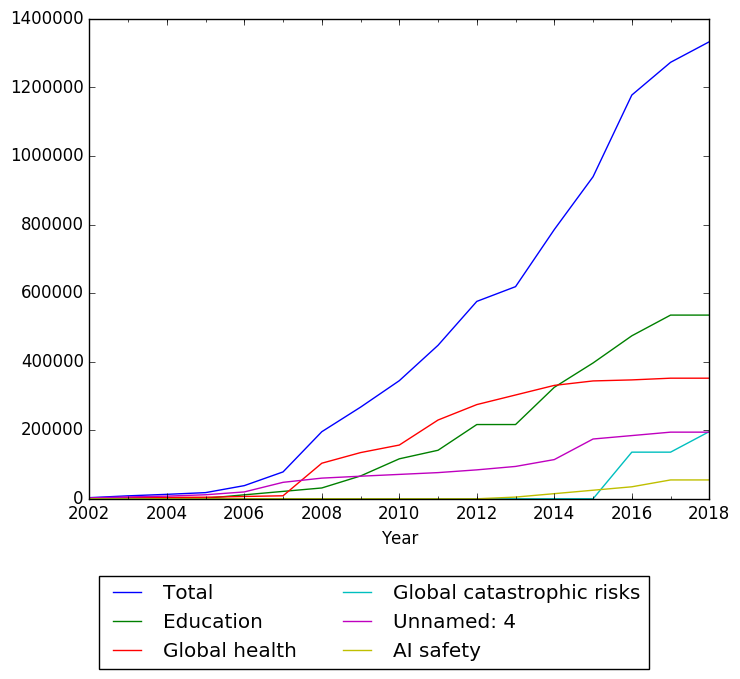 Centre for Effective Altruism 50,000.00 9 2015 -- https://www.gricf.org/2015-report.html -- For Giving What We Can. c/o Centre for Effective Altruism USA. 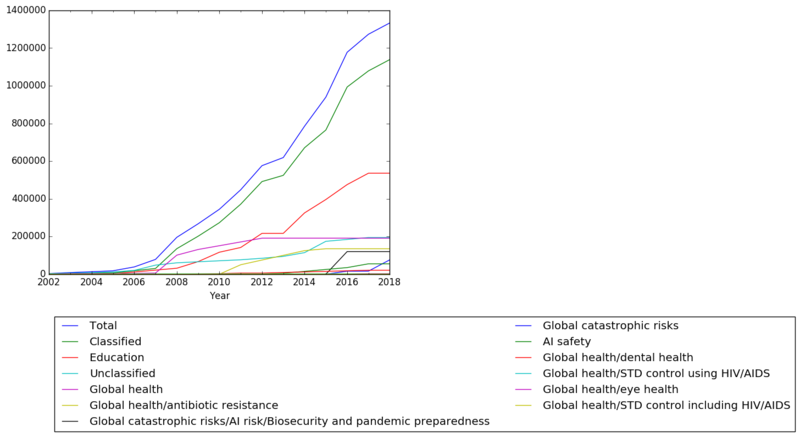 Keep Antibiotics Working 10,000.00 25 2015 Global health/antibiotic resistance https://www.gricf.org/2015-report.html -- c/o Food Animal Concerns Trust. 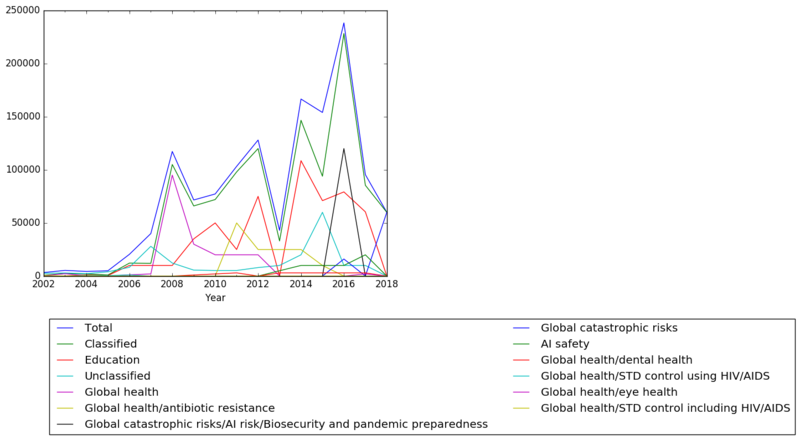 Keep Antibiotics Working 25,000.00 14 2014 Global health/antibiotic resistance https://www.gricf.org/2014-report.html -- c/o Food Animal Concerns Trust. Keep Antibiotics Working 25,000.00 14 2013 Global health/antibiotic resistance https://www.gricf.org/2013-report.html -- c/o Food Animal Concerns Trust. Keep Antibiotics Working 25,000.00 14 2012 Global health/antibiotic resistance https://www.gricf.org/2012-report.html -- c/o Food Animal Concerns Trust. Keep Antibiotics Working 50,000.00 9 2011 Global health/antibiotic resistance https://www.gricf.org/2011-report.html -- c/o Food Animal Concerns Trust. COLT-USA 1,000.00 61 2008 -- https://www.gricf.org/2008-report.html -- c/o Follow Your Dream. Helderberg Hospice 2,500.00 53 2007 -- https://www.gricf.org/2007-report.html -- c/o Hospice of Western Reserve. COLT-USA 1,000.00 61 2007 -- https://www.gricf.org/2007-report.html -- c/o Follow Your Dream. Consumer Project on Technology 5,000.00 38 2006 -- https://www.gricf.org/2006-report.html -- c/o Essential Information. Grantmakers Without Borders 250.00 93 2006 -- https://www.gricf.org/2006-report.html -- c/o Tides. Consumer Project on Technology 500.00 82 2005 -- https://www.gricf.org/2005-report.html -- c/o Essential Information. HealthGAP Coalition 500.00 82 2005 Global health/STD control using HIV/AIDS https://www.gricf.org/2005-report.html -- c/o Mobilization Against AIDS. Treatment Action Campaign 500.00 82 2005 -- https://www.gricf.org/2005-report.html -- c/o South Africa Development Fund. Consumer Project on Technology 1,000.00 61 2004 -- https://www.gricf.org/2004-report.html -- c/o Essential Information. Treatment Action Campaign 500.00 82 2004 -- https://www.gricf.org/2004-report.html -- c/o South Africa Development Fund. HealthGAP Coalition 500.00 82 2004 Global health/STD control using HIV/AIDS https://www.gricf.org/2004-report.html -- c/o Mobilization Against AIDS. Grantmakers Without Borders 100.00 102 2004 -- https://www.gricf.org/2004-report.html -- c/o Tides. Microbicides as an Alternative Solution 100.00 102 2004 -- https://www.gricf.org/2004-report.html -- c/o SFF-CIF. 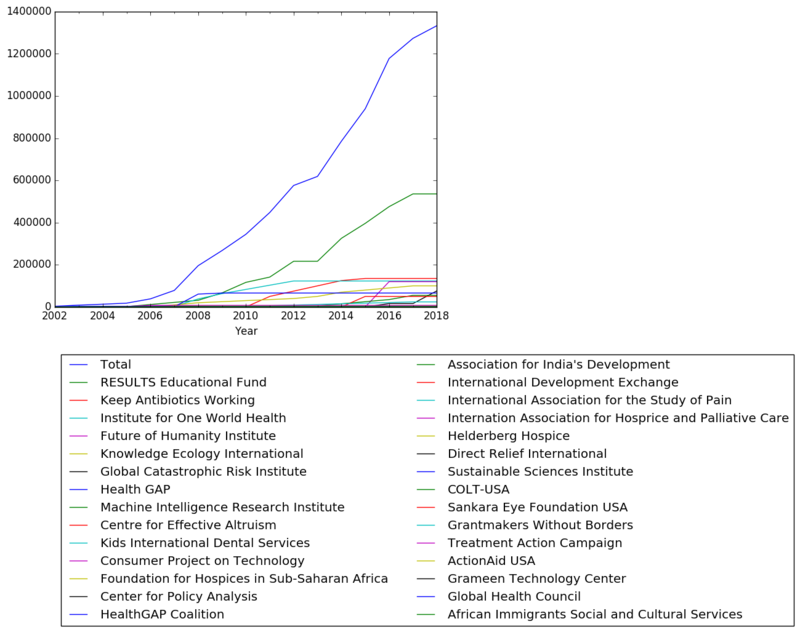 HealthGAP Coalition 1,000.00 61 2003 Global health https://www.gricf.org/2003-report.html -- c/o Mobilization Against AIDS. Grameen Technology Center 1,000.00 61 2003 -- https://www.gricf.org/2003-report.html -- c/o Grameen Foundation USA. Microbicides as an Alternative Solution 100.00 102 2003 -- https://www.gricf.org/2003-report.html -- c/o SFF-CIF. Bay Area International Development Organizations 100.00 102 2003 -- https://www.gricf.org/2003-report.html -- c/o Tides. Grantmakers Without Borders 100.00 102 2003 -- https://www.gricf.org/2003-report.html -- c/o Tides. Upper Nile Institute for Appropriate Technology 100.00 102 2003 -- https://www.gricf.org/2003-report.html -- c/o FPA. Consumer Project on Technology 1,000.00 61 2002 -- https://www.gricf.org/2002-report.html -- c/o Essential Information. Grantmakers Without Borders 100.00 102 2002 -- https://www.gricf.org/2002-report.html -- c/o Tides. Bay Area International Development Organizations 100.00 102 2002 -- https://www.gricf.org/2002-report.html -- c/o Tides.